As discussed in our previous posts about our Report Cards initiative, today we’re sharing one of our private templates. If you like the way it looks, feel free to chat in any time to let us know. We can enable it and help set it up just the way you like! The Primary Montessori template is one from the library of private templates. It’s a single-term, booklet-style report card that’s designed to show detailed grading criteria and comments. It’s perfect for Montessori elementary schools. Let’s take a look at a sample report card. If the Primary Montessori template looks good to you, please feel free to chat in and request it for your school account. We would be thrilled to enable it for you, as well as help set it up. 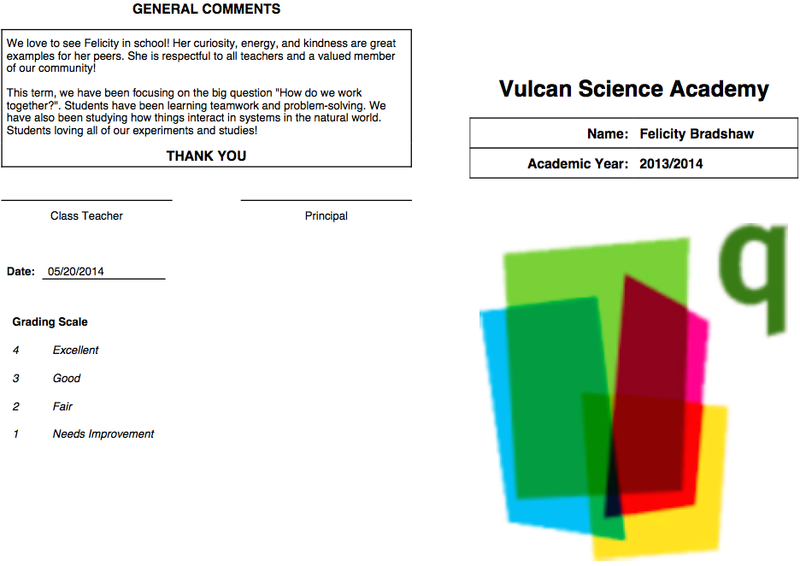 It’s a very detailed and informative report card – feel free to give it a try! Note: This template was also featured in a fabulous post written by Azroy on Montessori skills-based grading. Please feel free to check it out!